Before our oaks fell in a storm this past June, there was a small shaded bed around the base of one of the oaks filled with Azaleas, ferns, Hellebores, Caladiums, Begonias, Violas, and spring bulbs. 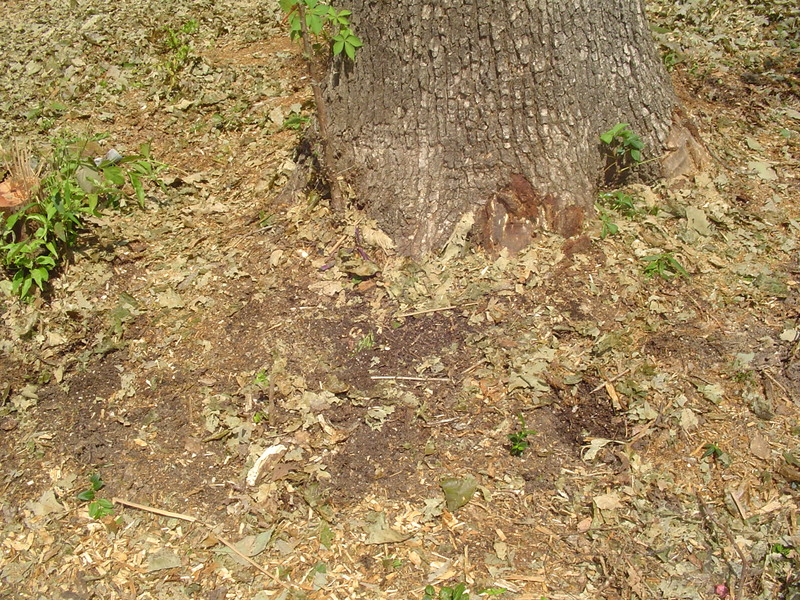 A 15’ Dogwood tree grew beside the oak, providing additional shade to the bed. The bed in mid-September 2011, a few weeks after Huricane Irene. 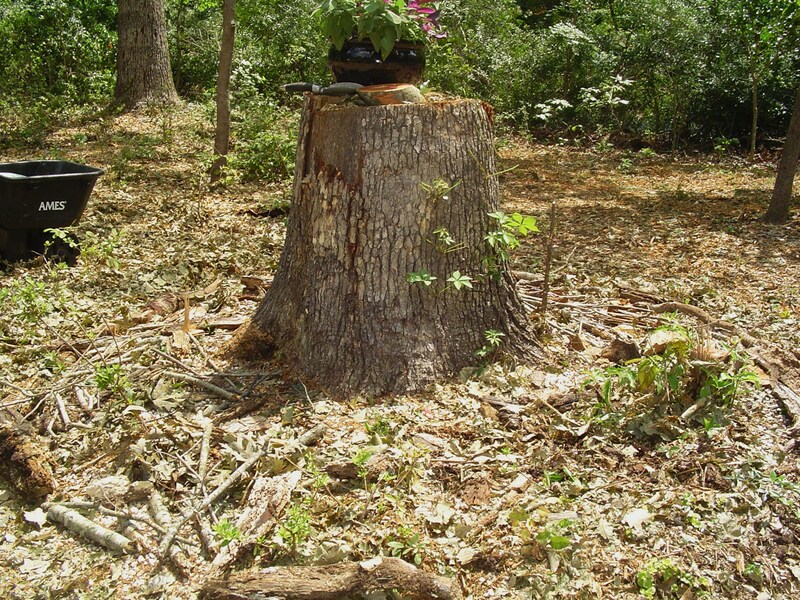 The trunk to the far right was a 15′ Dogwood, destroyed in the June 2013 storm. Filled with roots, and heavily grazed, everything struggled in this bed. When the crew cleaned up after the fallen trees, they also picked up the wood which had bordered this bed since before we bought the property. The azaleas were broken and the Hellebores were left to bake in the full sun. It was as bedraggled after the clean-up as the rest of the front part of our garden. This bed is at the top of the forest in view of the street. We drive by it coming and going, so it needs to look neat and cared for. 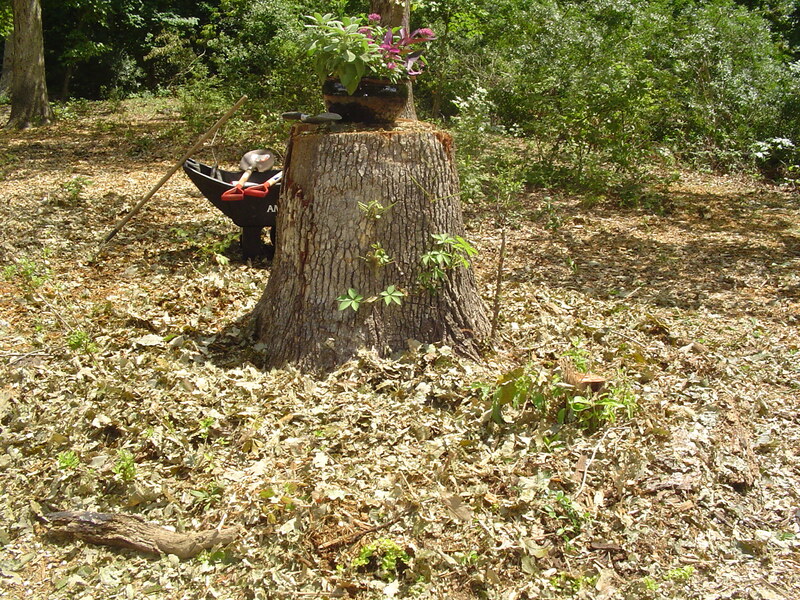 Time to begin again to build a productive raised bed around the stump of this once beautiful oak. Now that the remaining trees have been pruned and all of the equipment has come and gone, it’s time to begin again and restore this area. I’d like to experiment with a modified version of European hugelkultur, or building a self- sustaining raised bed on pieces of wood and compostable materials. In traditional hugelkultur the bed is constructed as a mound of wood several feet high, covered in organic materials and topsoil. A good friend learned about this system and has been building beds in this style behind her house all summer. She is having good results, and so I will experiment with this method as well. Hugelkultur is a sustainable organic gardening practice which allows plants to grow with very little further attention from the gardener once they establish. 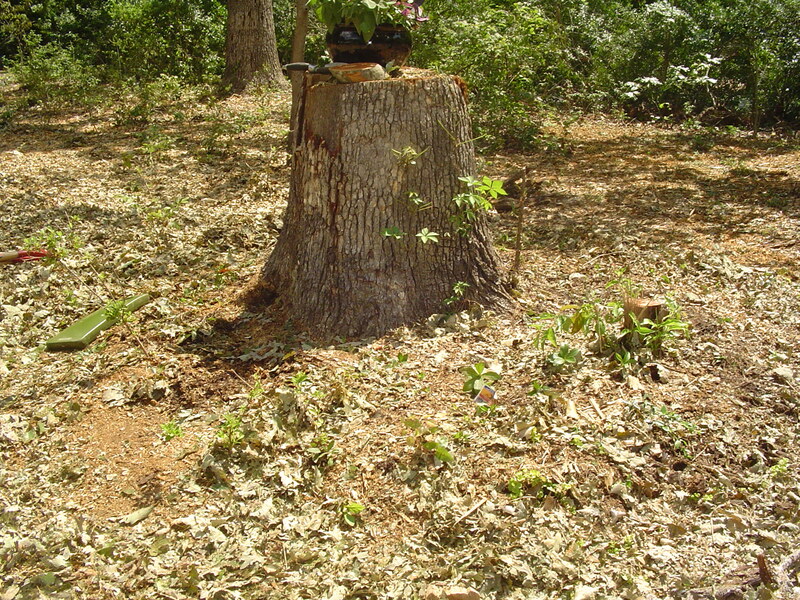 The biomass of the wood absorbs and holds water, then releases it slowly to the growing plants as needed. Rainwater is absorbed and retained so little additional irrigation is needed. 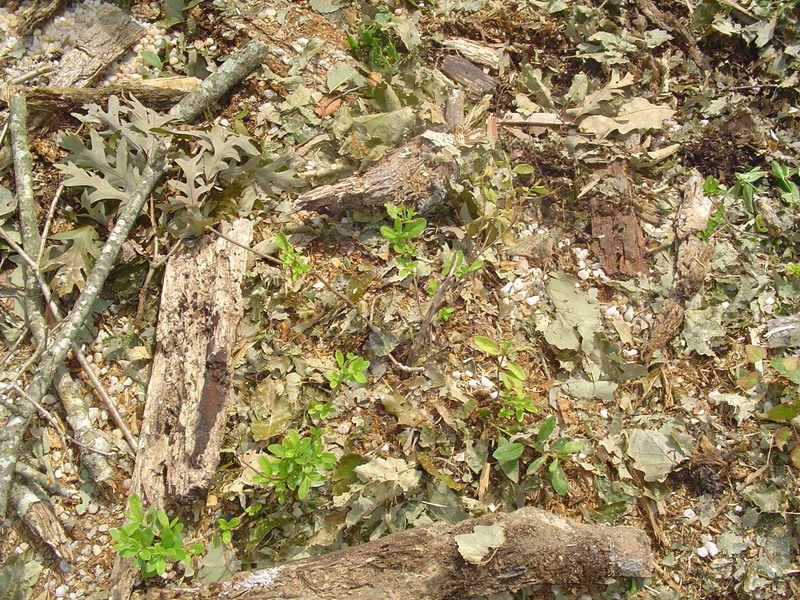 As the wood and other organic materials built into the base of the bed decompose, they release nutrients to the plants. 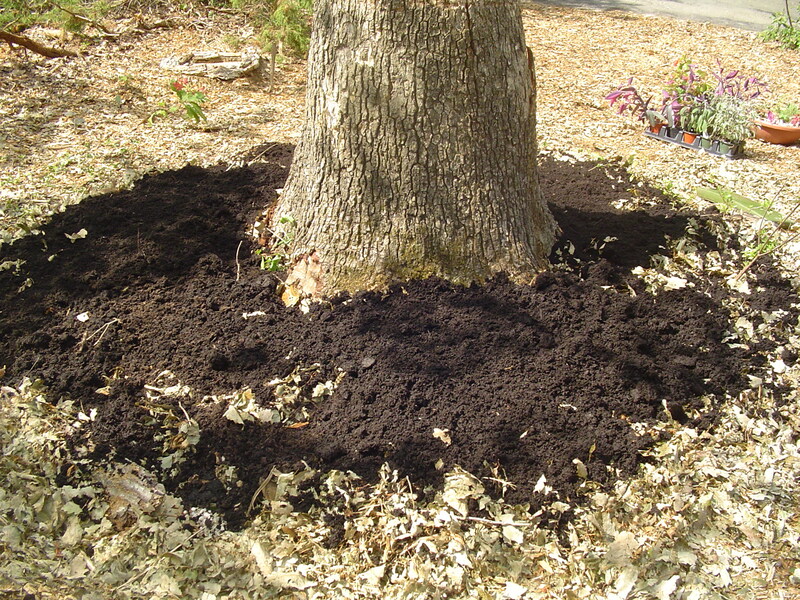 A rich community of bacteria, fungus, worms, and insects forms in such a bed limiting the need for additional fertilizer. Over a period of years the wood breaks down into rich soil to sustain the plants, many of them perennials, planted into a Hugelkultur bed. 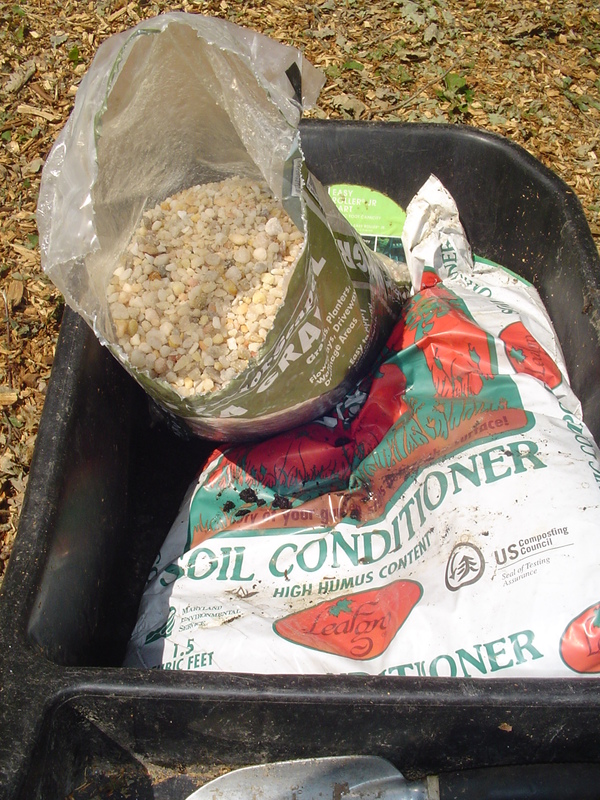 Pea gravel and compost are essential when I plant anything in the ground in this garden. Hellebores and ferns were dug out and moved to a shady fern bed. 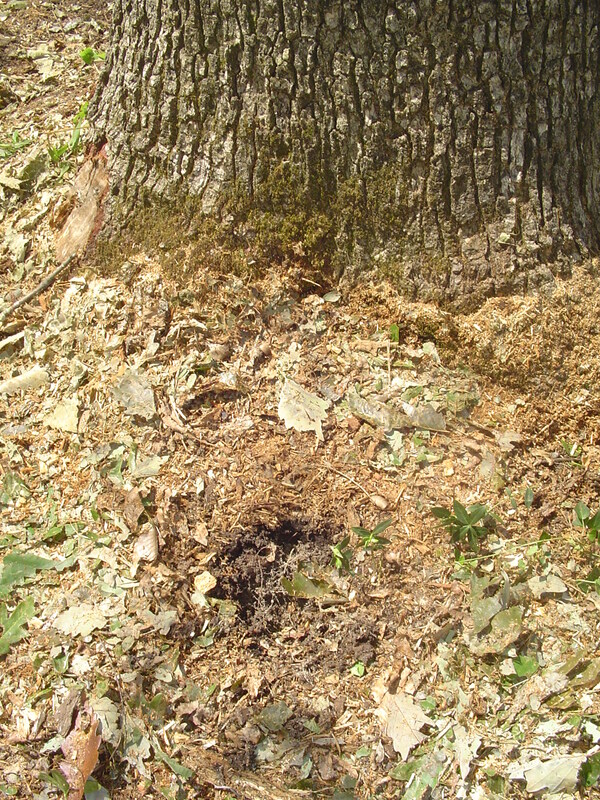 I’m building my bed around a large stump, on top of the massive root system of the tree, so I’m counting all of that biomass below the surface as the foundation for my bed. 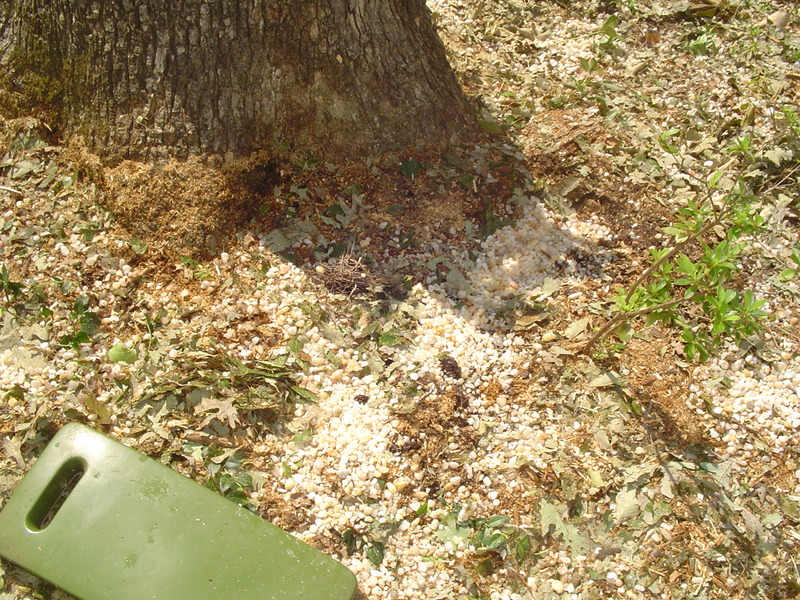 I add to that, above the surface, bits of limbs and bark left after the clean up and the rich mixture of chipped wood and leaves left behind from grinding up the trimmed limbs. 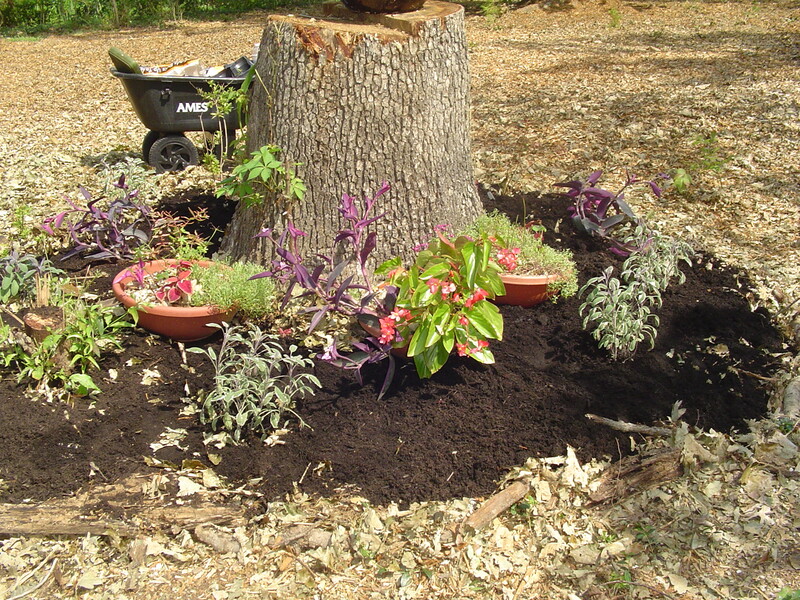 Mulch raked back to expose the remaining plants. I began by raking back all of the material left from grinding to expose the Hellebores, bits of fern, and remaining azalea twigs. The azaleas have been in place several years and so I’m hoping they will grow back from their roots and survive in spite of the bright sunlight. The hellebores need to be dug and moved to a shady area in the fern garden. A loose layer of pea gravel is poured first to make it more difficult for burrowing voles to get into this bed. Once they were all moved out, I gathered enough branches and bark to roughly cover the area I’ll convert into a raised bed. This new bed will be a few feet wider than what was there before and I plan to eventually work some food producing plants into the mix. The first layer of the new bed is a loose covering of pea gravel to slow down the burrowing voles a bit. Since the roots here are dense, I don’t think they’ll have an easy time getting in, but the gravel is a good foundation. 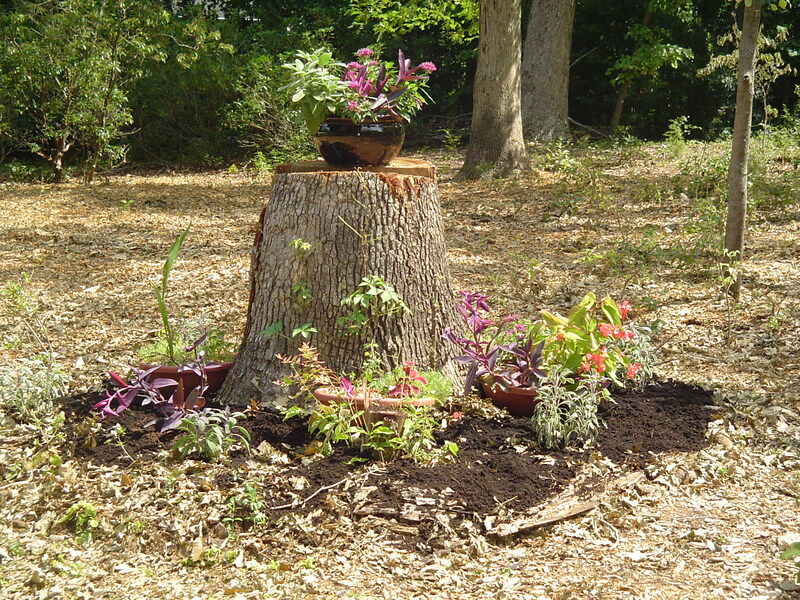 Bits of wood are laid to make a frame around the surviving azaleas. Next the gathered wood. I used larger pieces to frame out an area around the base of each remaining azalea so they don’t get buried. Leaving these shrubs in place will limit the depth of the new bed. Bits of branch and bark form a foundation for the new raised bed. 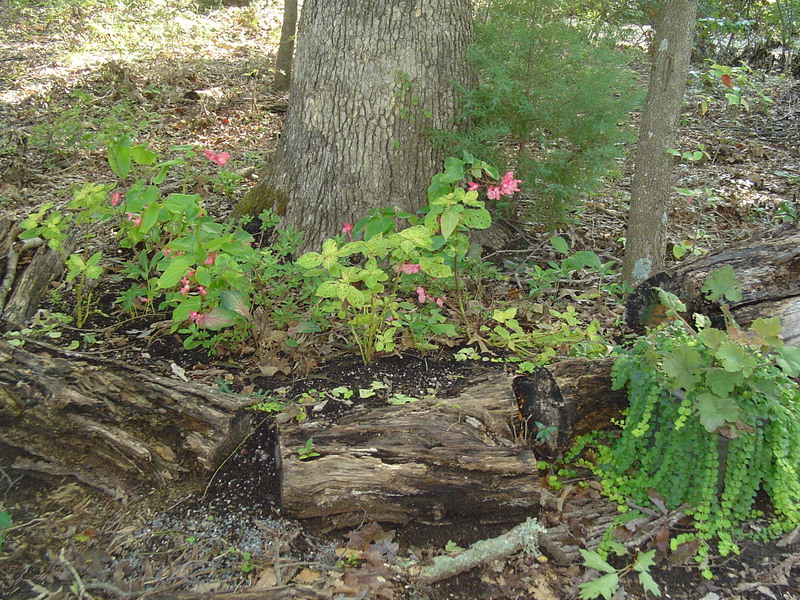 Once the layer of wood was in place, I topped the entire bed with a layer of the ground up wood and leaves, making it thinner around the azaleas and thicker in other areas. This is a nice mixture of high nitrogen material (the leaves) and high carbon material (the wood). I expect it to compost in place nicely, especially topped with the layer of finished compost. There were only three bags of finished compost on hand, and so I spread them out in a fairly thin layer over the entire bed. This certainly isn’t as deep as I want it, and so we’ll bring in more bags of compost over the coming weeks. New raised beds are traditionally constructed in the winter and left for several months to season and settle before planting. Since I’m constructing this one in late July I’ll limit the amount of new planting directly into the bed, and instead place several large planters on top of it. I’ll move plants out of these planters and into the bed in a few months. Chipped up wood and leaves spread over the foundation of wood will rot into good compost over time. I purchased six sage plants, two Setcreasea (Purple Heart), and one Hypericum moserianum,’Tricolor’, variegated St. John’s Wort. Three others are already growing in the pots, so a total of four will live in this bed. All of these plants are happy in hot, dry conditions and aren’t picky about soil. They’re deer resistant, and should be good pioneer plants as this bed is established. This is a very thin layer of compost, but I’ll keep adding more over the next several weeks. All of the new plants are laid out where they will grow. 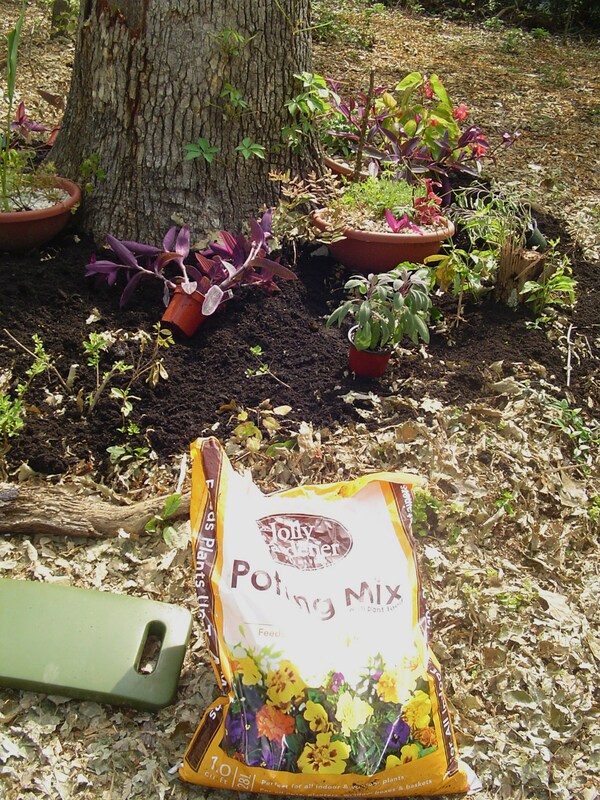 Potting mix will help the plants get started in this shallow bed. The layer of compost on top of the chipped wood and leaves is too thin to hold the plants, so I scooped out an area for each root ball into the chipped materials and filled in around the new plants with potting soil. All of these plants are root bound this late in the season. It is important to gently pull the roots apart a little so they will grow into the surrounding soil, and not continue to grow around in a circle, as they have been in the pot. Roots should venture out away from the plant to soak up water and nutrients. Roots growing in a circle aren’t able to provide a firm foundation for continued growth. All sorts of problems can develop and kill the plant. These plants are root bound at the end of the season. 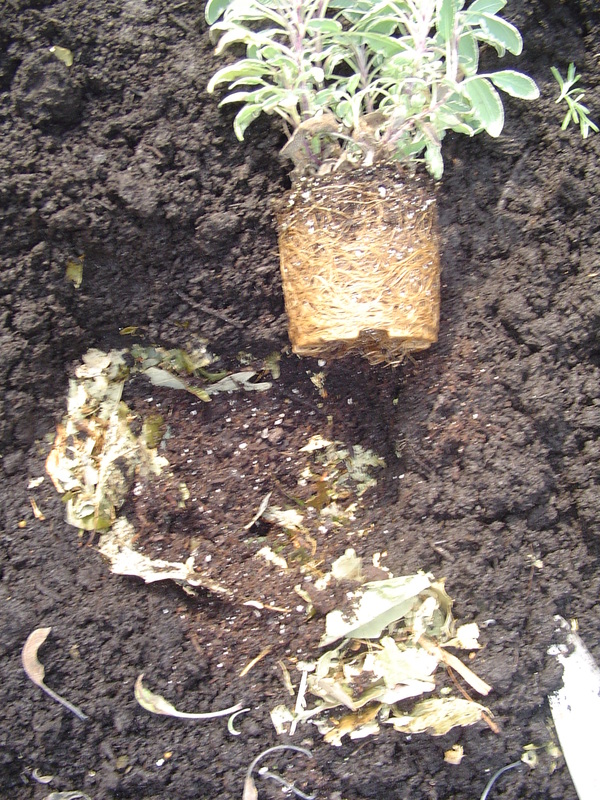 Roots need to be gently pulled loose from the root ball before the plant is settled into some fresh potting soil. All nine new plants are now planted, and the pots set between them. 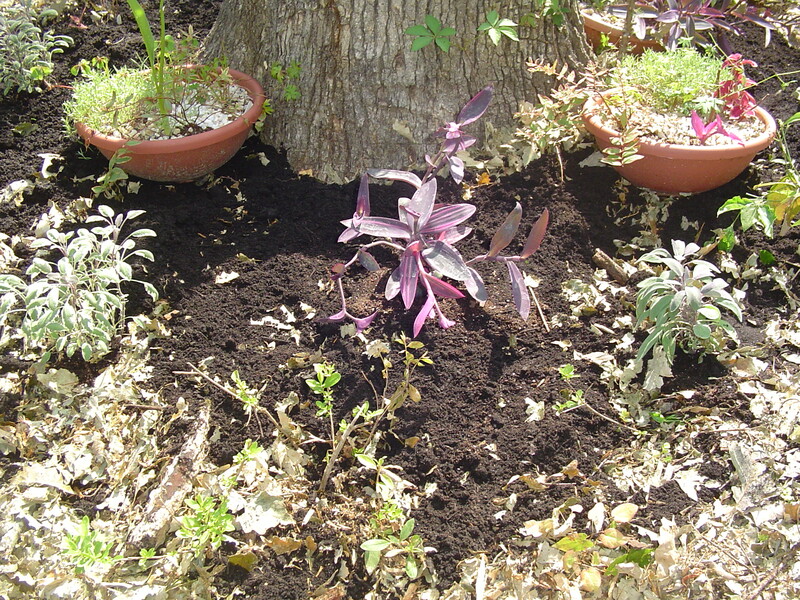 I’ll add more compost a little at a time, make sure the plants don’t dry out, and allow the bed to begin to “cook”. New plants are settled in the bed, and pots positioned between them. The bed will continue to settle in until autumn. In early September I plan to plant several kale plants between the sages. I expect the sage to protect them from any curious deer that get into the garden. Kale and sage are the first food crops added to this bed. By late October it will be time to move the remaining Hypericum out of the pots and into the soil. The nearly finished bed. More compost will be added to cover the remaining wood on the border, and eventually I’ll install some edging material to hold it all together. Perennial geraniums, received bare root in the mail this spring, are getting their start in the pots. They can also be moved into the bed or planted elsewhere. The Setcreasea will move into the garage before frost. The sages, St. John’s Wort, and kale will look good throughout the winter, and will probably be joined by a few violas for even more color. By spring, I can plant additional perennials, and this new raised bed will be ready to take its place as a productive part of our forest garden.